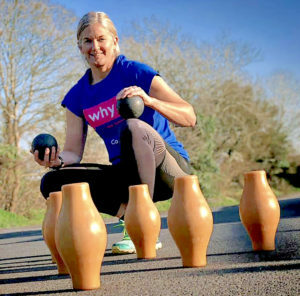 Charity fundraiser, world record breaker and Frome Person of the Year, Rachel Clark, is back this summer with another world record attempt and is calling on the community of Frome to get involved. The record to break this year is the highest number of players in a continuous eight-hour game of skittles. The challenge will take place outside Frome Library on Sunday 2nd June from 9am to 5pm at the Frome Independent market. The existing world record stands at 468 people, so to beat the record, each skittles player needs to throw three balls and clear the way for the next player in one minute or less. Rachel and her brothers, Daniel and Matthew, have raised more than £30,000 for local causes since 2011 in memory of their mother Shirley, with most of the money raised going to local charity We Hear You (WHY), who provide free professional counselling to anyone affected by a life-threatening condition. Anyone interested in participating in the skittles world record attempt, whether as a player, sticker upper, steward or official witness can sign up online at www.surveymonkey.co.uk/r/skittlesworldrecord General enquiries can be sent to Rachel and the team at fromeworldrecordskittles@gmail.co.uk However, registration is only possible via the online registration form.